5Pra Kroo Yan Wilaas (Luang Por Daeng), of Wat Khao Bandai It. 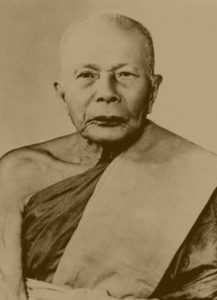 Luang Por Daeng of Wat Khao Bandai It (2421 – 2517 BE), was a Master Gaeji Ajarn of the Province of Petchburi in Olden Days, whose amulets are amongst the rarest and highly collected of all the Petchburi Masters, and indeed around the country, especially his 82nd Anniversary coin amulet above all others, which holds legendary status. Luang Por Daeng was born to Mr Bpaen and Mrs. Num in the year 2421 BE in Tamboon Bang Jag in Petchburi. There is a slight discrepancy with the exact date and day of his birth, some Biographies state it was in April 2421, whereas others state that it was in September 2422 BE. 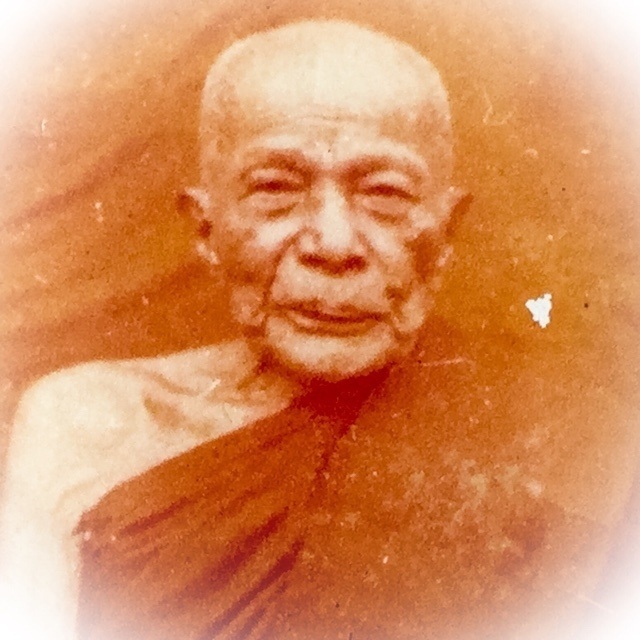 Luang Por Daeng, was also the older brother of another great Monk, Luang Por Pra Kroo Banya Chodtiwattana (Luang Por Jaroen), the ex Abbot of Wat Tong Noppakun (Petchburi). It is considered to be a very meritorious Karma of Luang Por Daeng’s parents, that they had two sons who both spent their whole lives as monks without ever disrobing up to their dying day, and in addition that both came to become abbots of their respected temples. Both received many official degrees within the Sangha, of merit and status. Both of these monks were awarded the noble status of Pra Kroo Sanya Badtr during their lifetimes. 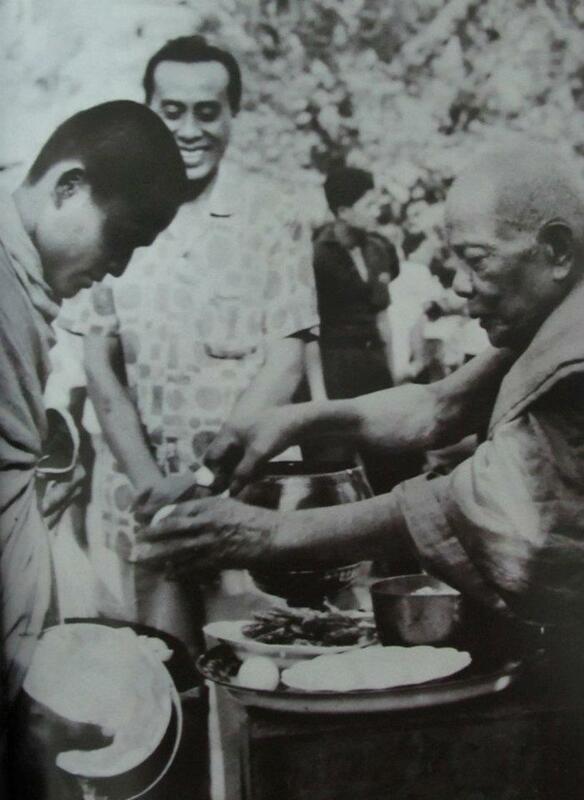 When Luang Por Daeng reached the coming of age (20) in the year 2441 BE, his parents took him to be ordained with Ajarn Plien, at Wat Khao Bandai It, where he was Ordained by Pra Kroo Yanwisut of Wat Gaen Hlek as his Upachaya Ordaining Officer (some authorships claim this to have been one year later in 2544, leaving the exact dates uncertain. 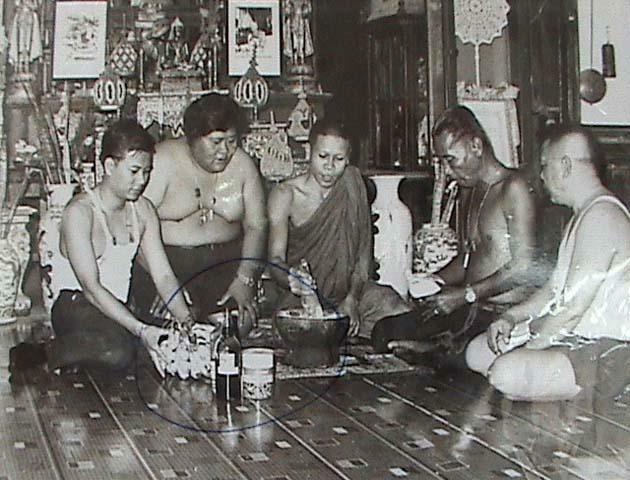 After Luang Por Daeng’s Ordination under the Ordained name of ‘Rodto’ (meaning ‘Red’ in Pali), he studied and practice Wicha Saiyasart Sorcery and Kammathana Vipassana Meditation with Luang Por Plien, until he completed all of his studies and Mastered every single Wicha that Luang Por Plien had to offer him. 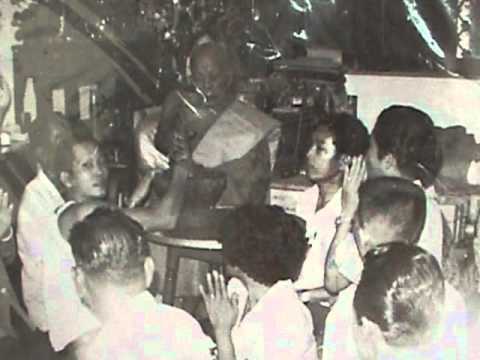 Later, as Luang Por Plien passed away in 2461 BE, Luang Por Daeng was elected to become the next abbot of Wat Khao Bandai It, at the (assumed) age of only 40 years old, which was his (assumed and approximated) 20th year of Ordained life. Luang Por Daeng’s Wicha Akom poweres became famous around the province and the devotees of Petchburi would travel from far and wide to receive his blessings and magic. In the year 2479, there was an empidemic in Petchburi which caused all of the famers buffalos and cattle to begin to die one after the other. Luang Por Dane made and empowered som red colored Pha Yant (Yantra Cloths) about the sieze of a handkerchief and told the local farmers to take one each and tie it to the tip of a bamboo stalk. They should plant it in the ground in the Cowshed. It appeared that the cowsheds which had used the Pha Yant Daeng of Luang Por Daeng did not suffer the epidemic or pass on contagions, and this caused Luang Por Daeng’s fame to spread far and wide around the province. Because of this story, devotees from very far afield began to flock to the temple of Wat Khao bandai It to beseech Luang Por Daeng for Magical Amulets, and Luang Por Daeng thus began to make more and ore Pha Yant and also Takrut scroll spells to hand out to the devotees. 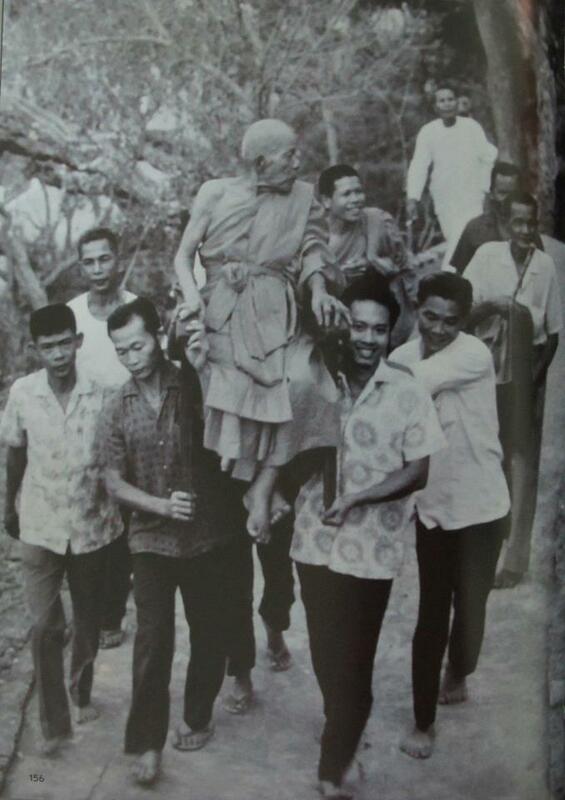 This however did not calm the devotees down to stop coming, rather, the miracles which those who had his amulets told about, caused Luang Por Daeng to become even more legendary and news of his powers reached even further afield, and people began to turn up from other provinces around the whole country, to pay reverence and beseech his blessings. On the 5th December 2502 BE, Luang Por Daeng received the honourable status and Sangha Title of ‘Pra Kroo Yan Wilas’ and received the Royal Pat Yos Monks fan in Ceremonial Recognition of his status. This was a great reason to celebrate for the Looksit (close devotees) of Luang Por Daeng at Wat Khao Bandai It. And so the making of the first edition Guru Monk Coin of Luang Por Daeng was set into motion before the official ceremony was to be held, in order to be able to distribute the amulets to the devotees who came to attend the ceremony to honour Luang Por Daeng’s elevation in status. This first ever coin was a Rian Roop Khai Nuea Tong Daeng Rom Dam (oval shaped copper with black oiled finish with head and shoulder cameo image of Luang Por). Only 15,000 of these amulets were made in Tong Daeng Rom dam, and another 82 (+1) special Gammagarn coins were made in solid silver (equal to the age of Luang Por Daeng at the time). The coins were 3.5 x 2.6 Cm in size, with the cameo of Luang Por Daeng upon the front face, and the date of the edition 2503 BE (๒๕๐๓) on the top left side of front face, with the words ‘Aayu 82’ on the top right side of the front face (อายุ๘๒). The bottom edge of the front face of the coin had the words ‘Pra Kroo Yan Wilas Daeng “พระครูญานวิลาส (แดง)” emblazoned. The rear face has a square Yantra (Yant See) with Sacred Khom Agkhara containing Buddhist heart Mantras (Kata Hua Jai Pra Puttakun) around the surface in Khom Sanskrit. This first edition coin amulet is one of the most famous coin amulets in all Thai Amulet Appreciation societies, and is world famous as a Classic Pim Niyom Masterpiece, and is in addition both extremely rare, and expensive item. There are many numbers of fakes of this coin, be they well made or badly made, the number of forgers who have put their hand to trying to deceive with forgeries of this all time classic are almost more than you can count on all fingers and toes, and those of your friends. The amulet was extremely famous for its Klaew Klaad and Kong Grapan Chadtri power to evade deadly dangers and protect from gunshots and blades. The coin became so famous in its first couple of years that Luang Por daeng was forced to make another series of coins (second edition) in the year 2507 BE. The second edition coin was identical to the first edition except for one of the Khom Agkhara letters which was at the bottom of all looked different (the letter ‘Ae’ which in first edition resembled the Thai letter ฃ. In the Second edition, the Khom letter ‘Ae’ resembles more the Thai number 8 (๘). This coin produced as many Klaew Klaad miracles with the devotees as the first edition, and became just as famous and hard to come by as years passed. Luang Por Daeng also made some smaller versions in this second edition, to hand out to the ladies (Mae Krua), and those coins were given the name of the ‘Run Jaek Mae Krua’ (Edition to hand out to the House Wives). In the year 2510 BE, as the celebration of Luang Por Daneg’s birthday came around, the Looksit arranged for the making of one more Rian Kanajarn monk coin amulet to be made for Luang Por to bless. This time the image cameo of Luang Por daeng was changed to reflect his greater age as time had passed, and the writing around the edges of the coin were changed to say พ.ศ. ๒๕๑๐ ที่ระลึกอายุครบ ๘๙ปี (2510 BE commemoration of the 89th Anniversary) and the name พระครูญานวิลาส (Pra Kroo Yan Wilas) on the bottom of the front face of coin. The rear face was identical with the first two editions with the exception that the Chinese word ‘Jow’ was added next to the Khom Letter ‘U’ below the square Yant See Yantra. This edition had coins in various sacred metals, which included Nuea Tong Daeng Rom dam (blackened copper), Nuea Nak (Bronze), Nuea Ngern (solid Silver). The copper coins were made in the largest numbers, which was documented as being 2000 coins made. In the year 2511 BE, as Luang Por daeng reached the age of 90 years old, Army Captain Paetyakul of the first regiment (who was a citizen of Petchaboon by birth) beseeched Luang Por daeng for permission to create a new edition of coin amulets in the form of a shield shape, The captain comissioned the Royal Mint to create the coin to make the design and produce this very high quality coin amulet, with 48,000 made in Nuea Tong Daeng (copper), and to make some in solid silver and solid gold, according to however many devotees paid deposit for pre-orders. This edition was called the ‘Run Mae Tap Sang’ (National Guards Edition), also known as the ‘Rian Mae Tap’ coin. Some coins were also made in Albaca (numbers unknown). This edition is now second place in the preference of collectors of the amulets of Luang Por Daeng (after the first edition coin). This edition had an especially large and long blessing and empowerment ceremony. First they were blessed over a period of time by Luang Por daeng in solitary, and then they received a large Buddha Abhiseka ceremony to bless them again thorughout 5 days and nights, after which the amulets were released to the public. Once the coins were released, a great number of people immediately rented a large number of them within a very short time, and many people took the coins to go and test their powers (despite this being forbidden rule of magic, as one should save the powers of amulets for the time they are needed, and not waste it on testing them). They took the coins and shot at them with a gun just nearby to the temple, and something strange occurred; The Gun Broke in two! For this reason, this edition came to be known as the ‘Rian Run Pern Dtaek’ (Broken Gun Edition). 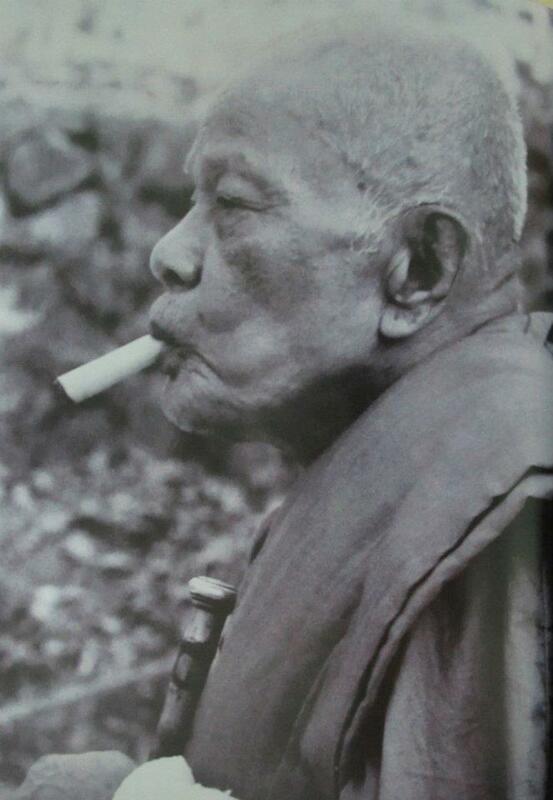 Luang Por Daeng continued to make more amulets throughout his life, until he passed away on the 16th of january 2517 BE at the age of 96 years old, after 74 years of life as a monk. 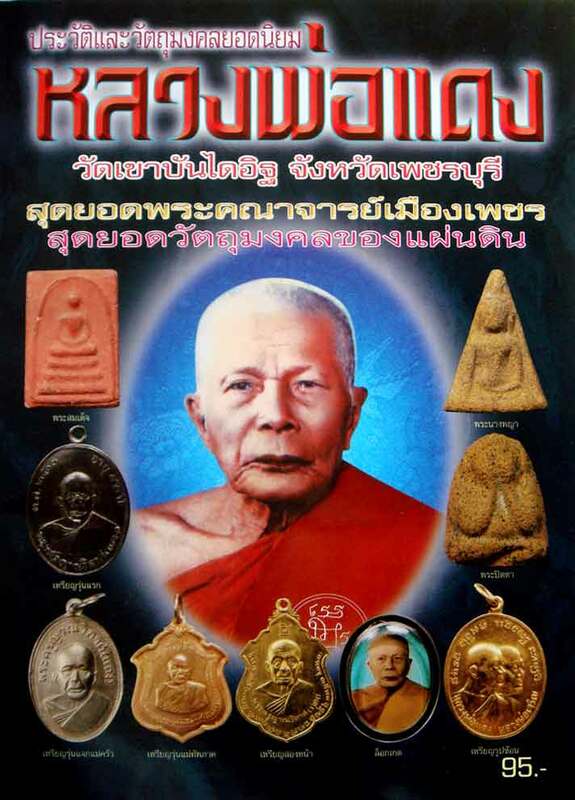 The most famous and documented of Luang Por Daeng’s other editions, were the Roop Sorn Luang Por Daeng Luang Por Jaroen 2512 – 2513 BE, the Rian Song Pi Nong, the Rian Run JPR 2513, Roop Tai Luang Por Daeng Photo Amulets (made throughout his trajectory with photos made by different professional photographers as Luang Por aged over the years). The Pra Pong Pra Akara Sawok 2513 BE Sacred Powder Amulet, the 2513 and 2516 BE, Pra Somdej Pong Yan Wilas Sacred Powder amulets in oblong Pra Somdej , triangular Pim Nang Paya, and Pra Pid Ta versions, Run Nai Taharn 2513, Pra Pong Khun Chang 2513 BE Sacred Powder Amulet, Pra Khun Phaen Luang Por Daeng 2513 BE Amulet, Rian Glom Wat Tung 2514 BE, Roop Khai Sorng Hnaa 2514 BE, Rian Roop Arm 2 Hnaa 2514 BE Rian Han Khang 2516 BE, and the Rian Run Kuk Khao 2517 BE (Kneeling Monk Edition) coin Amulet.